You have a greater chance of being killed in an early model Toyota Corolla than a later model version. 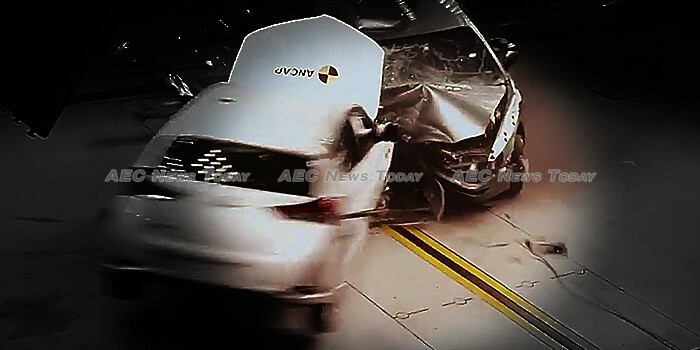 That is the grim message from road safety experts in Australia and New Zealand after a controlled test saw two models of one of the worlds best selling cars crashed head-on at just 64 kilometres per hour (kph) (about 40 mph). Conducted by Australia’s independent vehicle safety advocate, Australasian New Car Assessment Programme (ANCAP), the Toyota Corolla crash test dramatically puts to rest the urban myth that older vehicles are safer than newer models, because they are heavier, and built with more robust materials. In the video above a 1998 Toyota Corolla is propelled into a 2015 modelling travelling in the opposite direction. Impact is on the driver-side quarter panel of each vehicle. Although only a medium-high speed crash with an impact speed of 128 kph (80 mph), the result is devastating… for the driver of the older vehicle. The cabin of the earlier model Toyota Corolla is buckled and distorted, the door beam has broken away and is protruding through the bottom of the door, while the front driver’s side wheel has been pushed back into the driver’s-side foot well. Camera’s mounted internally capture the violent forces exerted onto the driver, who’s head first strikes the steering wheel, then the dashboard, before being snapped back against the seat, which breaks free from the floor. By comparison the 2015 Toyota Corolla shows enhanced impact absorbing protection with the cabin retaining its shape and the door having the appearance of being openable. Inside, the driver is surrounded by front and side airbags, with internal camera’s showing the driver has no impact with the steering wheel or dashboard at the time of impact. In the video above Stella Stocks, general manager of The New Zealand Automobile Association (AA Motoring) highlights the increased risks associated with the older model Toyota Corolla, grimly assessing the situation by saying “the person in this probably wouldn’t survive”. Part of a campaign to encourage lower prices on new vehicles, and to encourage owners of older vehicles to update to newer models, the Toyota Corolla crash test reinforces findings by ANCAP that vehicles built prior to 2001 account for 36 per cent of all fatal crashes on Australian roads, while only accounting for 20 per cent of all vehicles. First manufactured in 1966 and now built at a dozen plants globally, including in Vietnam and Thailand, the Toyota Corolla is one the world’s top selling automobiles. More than 40 million had been sold up until 2013. Their reputation for reliability, and sturdiness means that models dating back ten, twenty or more years are not an uncommon on Asean’s roads. Toyota Motor Thailand (TMT) did not respond to requests to comment on the Toyota Corolla crash test or on how many Toyota Corolla’s had been sold throughout Asean since the model was first released.